A UFC fighter has made headlines following a run in with police, caught on camera, during which he was tased and arrested after asking the cops to identify themselves. 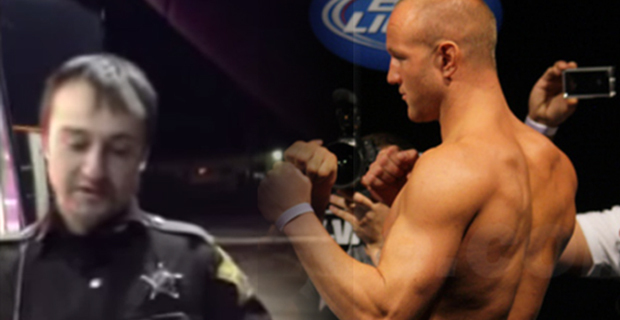 In the video, mixed martial artist Dave Herman is seen asking the cops “Do I know you?” and “Who are you?” after they pulled him over during a routine stop. Herman says he opted to stop in the first well lit, public area he could find when the cops began following him, in order to ensure his own safety and that of his wife and infant child, also in the vehicle. When Herman, hands raised above his head in a non threatening manner, continued to ask the cops to show him ID, they fired a taser dart and shocked him with 50,000 volts. As soon as the cops realized that Madeleine Herman was filming the incident, and when she also asked them to show their badges, they identified themselves. One of the cops is also briefly seen discussing with a superior the fact that he was not wearing a body camera nor did he have an in vehicle camera turned on during the incident. Herman, a professional fighter since 2006, claims he was flagged by police for driving with his hazard lights on, saying he was having trouble with the vehicle losing power. He was arrested and held overnight. Herman also claims that the police attempted to take naked photos of him after the arrest. “I sat for five minutes and they tried to take naked pictures of me. They did actually force me to give them some naked pics, which was pretty messed up.” Herman states. Herman faces three felony charges, as described by his wife in the video, including battery and endangerment of a dependent. A pre-trial date has been set for early March. “I want all the charges leveled against me that they committed against me, charged against them. This is retarded. That cop needs to go to the police station and file all those charges against himself. That’s what I’d like to see happen. I want his badge. Somebody who acts like that should not be a police officer.” Herman adds in the interview. While police are not specifically required to show three forms of ID, as stated by Herman in the video, they are required to identify themselves if asked by a member of the public.